Constructed of .006 type 316-L stainless steel. Tested and approved to UL 1777 zero clearance*. Air and watertight 7 ply unbreakable interlocked seam. Durable and flexibility to insure safe installations. 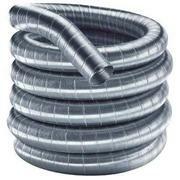 Available in diameters from 3" to 18" inches. Lengths up to 100 feet. All purpose for use with oil, wood, gas and pellet. Lifetime Warranty Made in the U.S.A.